I think it’s obvious that I have a problem. Ever since I learned about salads in a jar, I have gone a bit crazy with them. I’m not sure if there’s a support group for people with this problem, but I’m beginning to think that, perhaps, I might need to join. 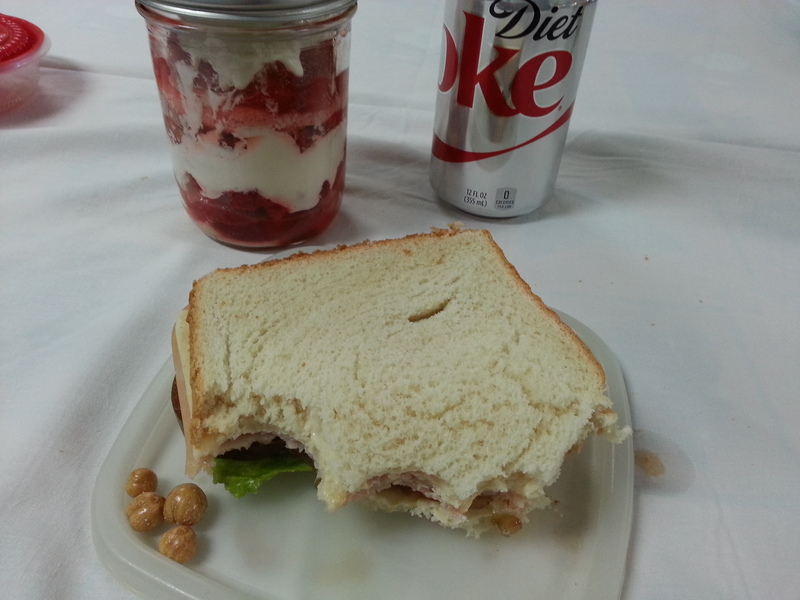 Just this last week, I packed soup in one jar and salad in another and took them for lunch. Do you think I have a problem? I anxiously await your response. Today’s post is about dessert in a jar. 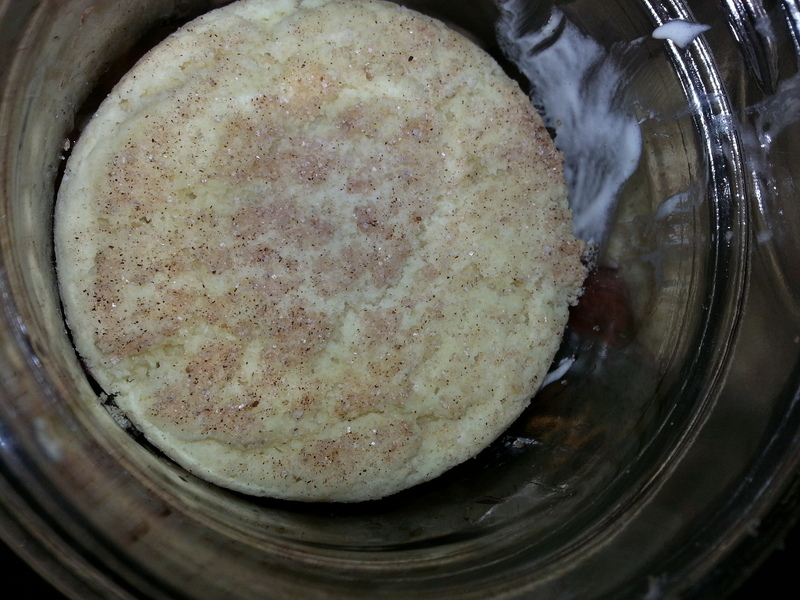 It all began with some snickerdoodle cookies that were getting stale. I’m still not certain what happened that the cookies were forgotten in the microwave, but they had arrived at the point where they were good only for dunking in milk or coffee lest one risk breaking a tooth. My children and husband are not really cookie dunkers. I considered the cookies and I also considered the fresh strawberries that I had purchased during a recent trip to a roadside produce stand. I had an idea. 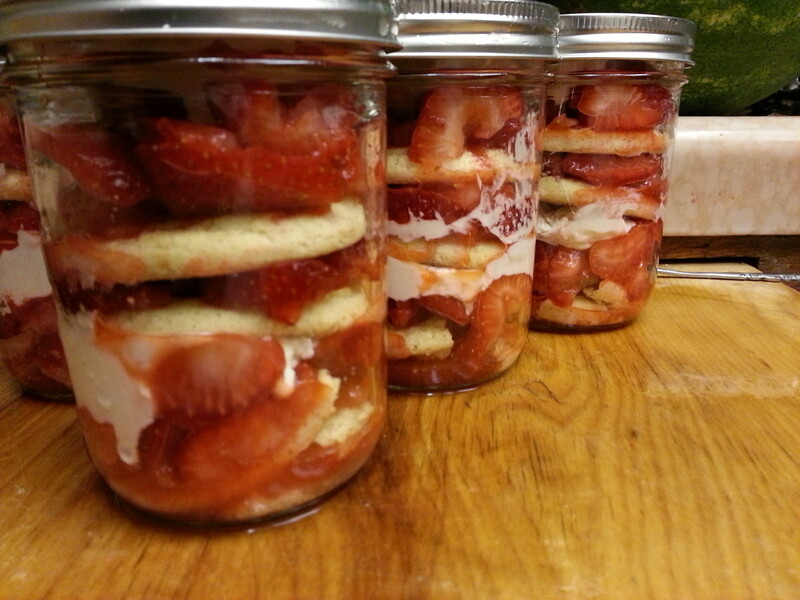 What if I macerated some of the strawberries like I would for shortcake and layered them with the cookies? Would that be a good combination? 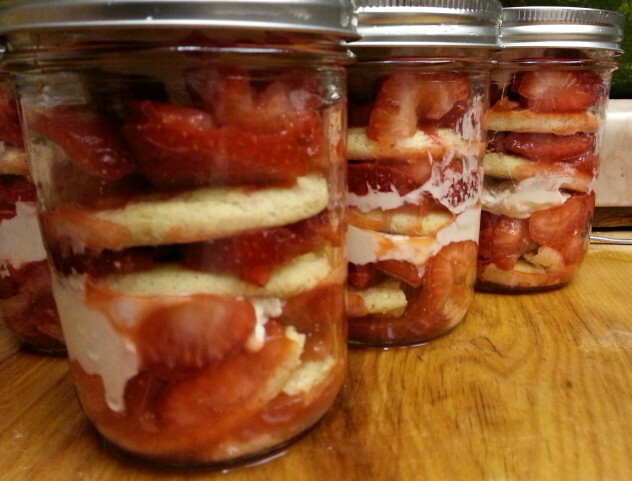 As I was looking for an appropriate vessel into which I could put my strawberry-cookie concoction, I spied my wide mouth pint jars, and inspiration struck. 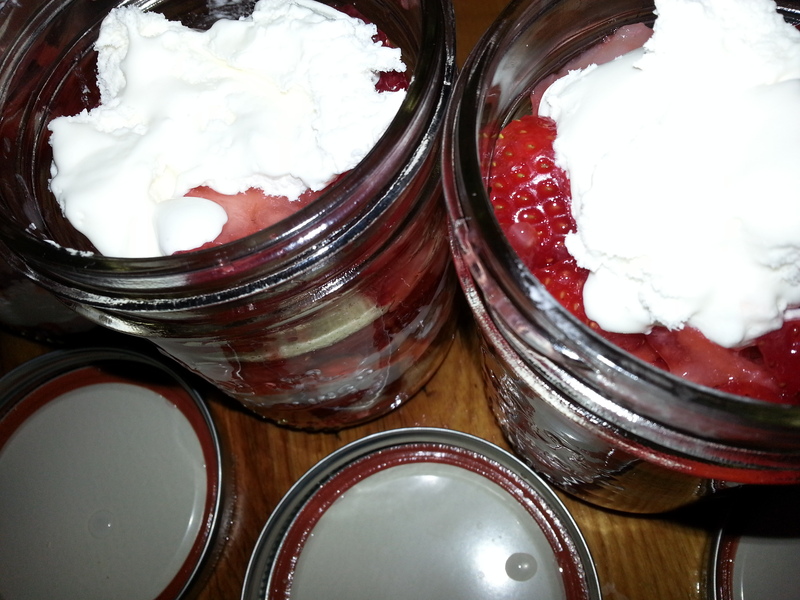 Dessert in a jar was the perfect solution. The Strawberry Shortcake Trifle, as I was already beginning to think of it, would be perfect in the mason jars because it would be pre-packaged for lunches or picnics. I immediately set to work. 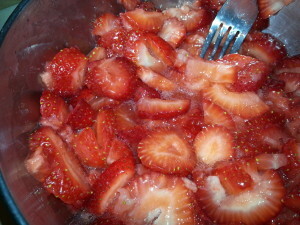 I started with fresh strawberries that were very sweet and juicy. I used two pints of them. 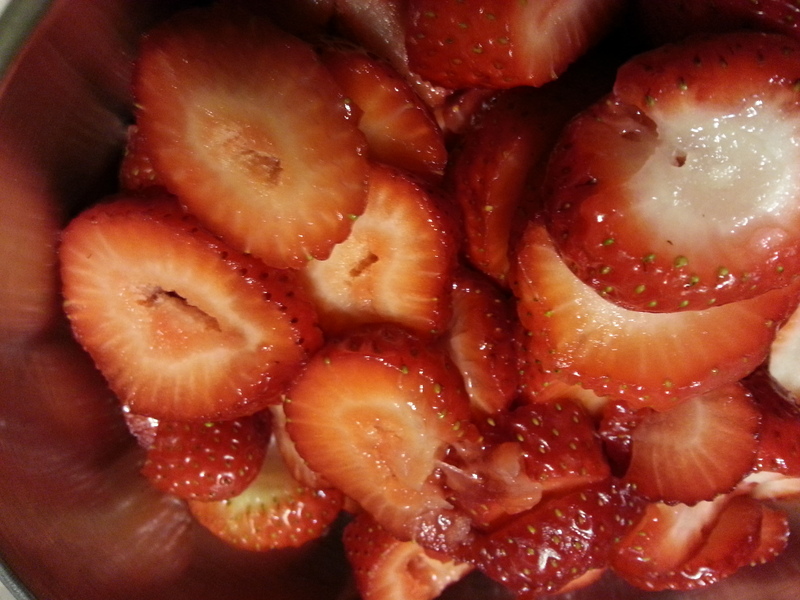 The strawberries were washed, capped, and sliced. 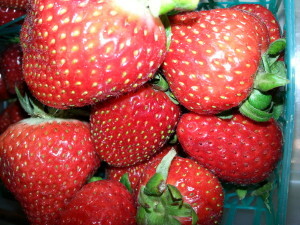 (Capping refers to the removal of the green leaves left on top of the strawberry after harvest.) These strawberries were very sweet. 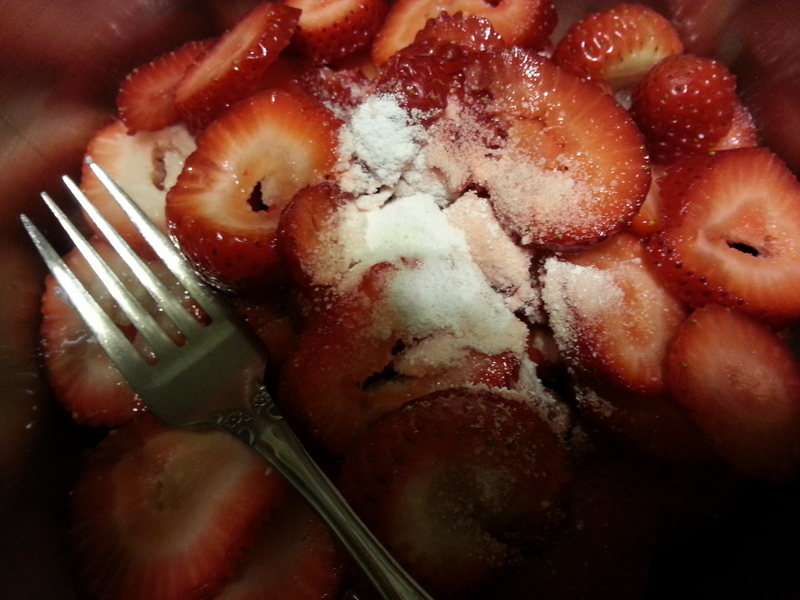 I added only two tablespoons of sugar to them. Sugar substitute can also be used in place of sugar if you prefer. 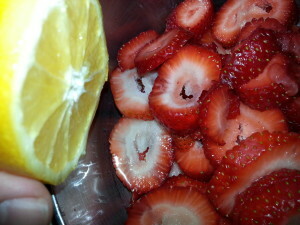 Next, I squeezed the juice from half of a lemon onto the strawberries. The lemon was very large and very juicy. 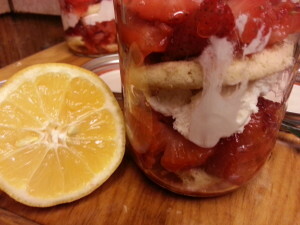 Why do you add lemon juice to the strawberries? The citric acid in the lemon juice helps the strawberries to retain that pretty red color. Without it, they get dark and aren’t as pretty. 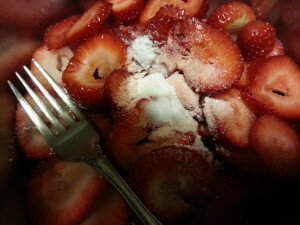 I mixed the sugar, lemon juice, and strawberries together, and while I mixed, I mashed the strawberries a bit with the back of the fork, breaking them up so that they release some of their juice. This process is called macerating the berries. It’s more important when the berries are slightly under ripe, but I really needed the strawberry juice to soften those stale cookies. 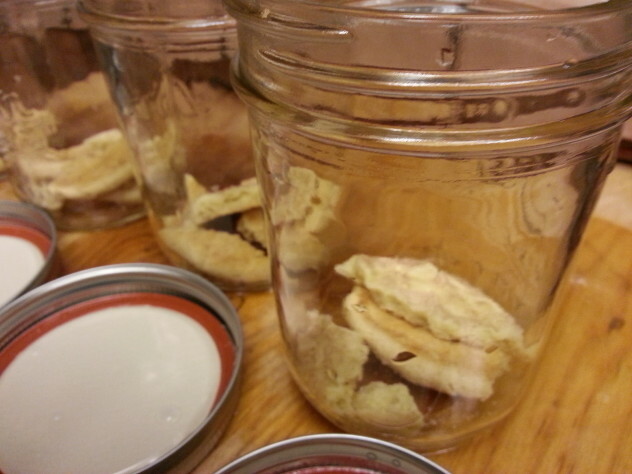 First, I placed a cookie into the bottom of each jar. The jar tapered slightly, so the whole cookie wouldn’t fit across the bottom layer. 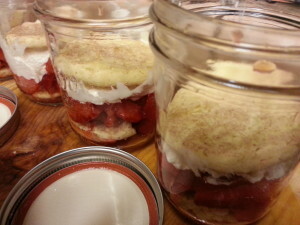 A layer of macerated strawberries was layered on top of the cookie to soften it up. Next, I spooned some cool whip on top of the strawberries. I chose cool whip because I knew it wouldn’t disintegrate like my homemade whipped cream. I had envisioned two layers of cookie, strawberries, then cream, but as I placed a whole cookie on top of the cream, I realized that I would still have leftover cookies. I had to deviate from my original plan if I was to use up all of the cookies. I layered more strawberries on top of the second cookie. Then, I placed another cookie on top of the strawberries. This cookie was topped with more strawberries. Finally, the entire thing was topped with more whipped topping. I still had another basket of strawberries in the fridge, so I capped and halved three berries. I crushed the last, remaining cookie and sprinkled the top of the cream with cookie crumbs and put a half strawberry in the middle of the cream. I wanted it to look pretty when the top came off. Unfortunately, I forgot to take a picture of it. 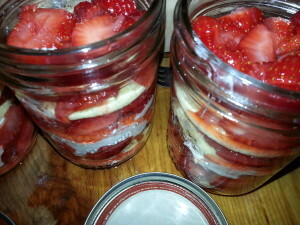 They weren’t perfect, but after they sat in the fridge overnight, these strawberry shortcake trifles were perfect. I was worried that the cookies would become mushy, but they were perfect. Everyone loved them. 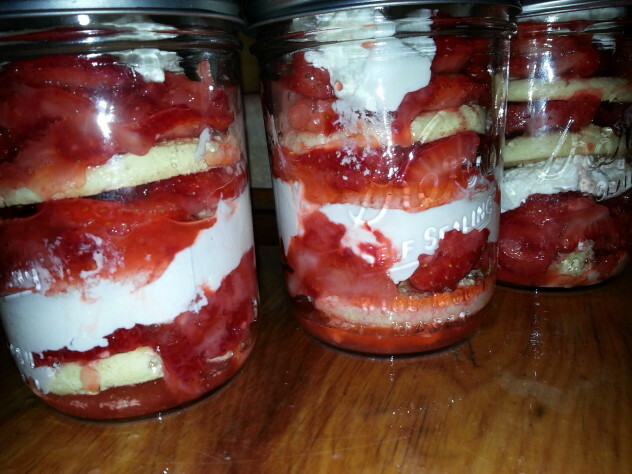 This made four pint sized “trifles”, and we loved them, but in the interest of good nutrition, we are thinking that perhaps desserts should be made in wide mouthed eight ounce jars instead. These shortcake trifles make the perfect dessert to pack for a picnic, too. Since they can be made a day ahead and stored in the fridge, all one needs to do is grab and go. These strawberry shortcake trifles are delicious and easy to make. Give them a try. I realize that traditionally, a trifle is fruit layered with cake, but a cookie isn’t really all that different from a cake is it? After all, don’t I use cake mix to make cookies? Juice of ½ large lemon (approximately ¼ cup). 10 oz container of cool whip frozen topping, thawed. Wash and cap all strawberries. Slice all of the remaining berries and place into a bowl. Mix well, mashing the strawberries slightly to get them to release some of their juice. Taste and add additional sugar if needed. Allow strawberries to rest for 10 minutes. Layer a cookie in the bottom of a clean wide mouthed pint jar, breaking cookie if necessary to fit into the jar. Top strawberries with whipped topping. 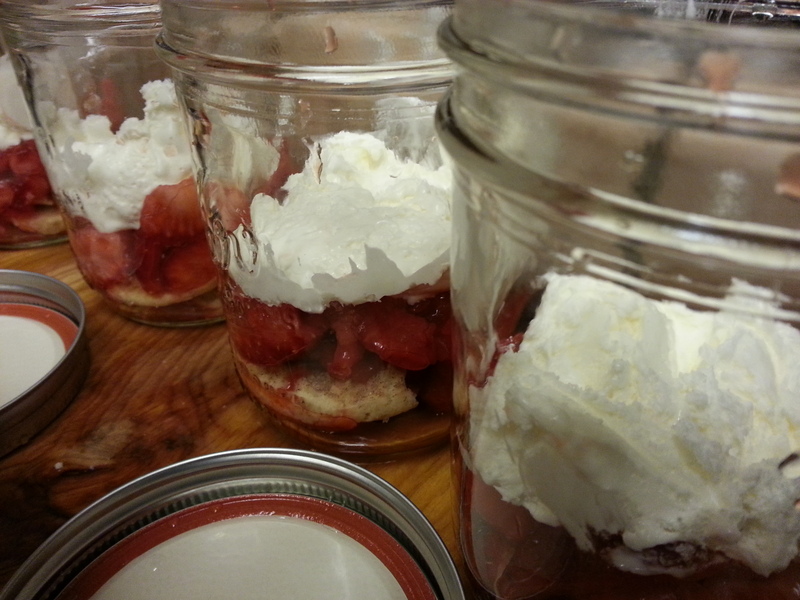 Repeat until jar is full, ending with whipped topping. There should be one cookie left over. Crush this remaining cookie and sprinkle evenly over the whipped topping. Place ½ of a whole berry in the center of the cream and cookie crumb topping. Cover jars and store in the refrigerator overnight or for up to 36 hours. Patti Cake, I LOVE this recipe and can’t wait to try it. 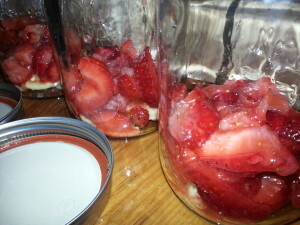 You have got to do an e-book on your jar recipes, my food blogging friend!! If your photos are upside down and sideways, I know that you are an iPhone user. You can read more about this issue at the following url. I freely admit that I am obsessed with storing and serving food in jars. I could collect my recipes and put them into a book, but it’s a lot of work. I will give it some thought.